A holiday pastime for many native San Franciscans, the annual Holiday Ice Rink in Union Square is now open through January 19, 2015. Spend the night gliding across the ice with your loved ones under the beautiful lights of the Union Square Christmas tree. With all of the holiday shoppers and magical holiday decorations surrounding Union Square, there is no better place to spend some quality time with your family this holiday season. 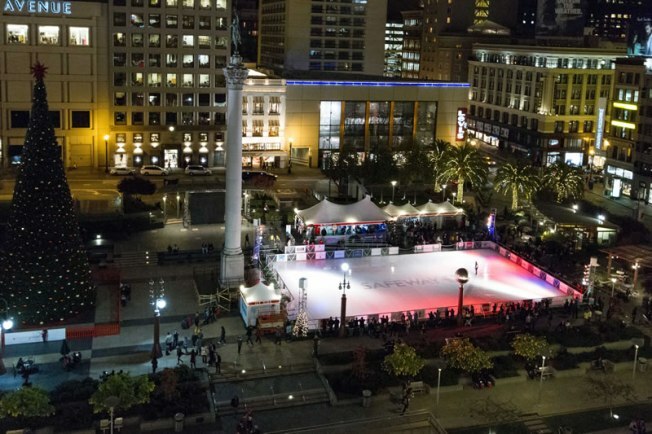 The ice rink is open daily from 10:00 AM to 11:30 PM and located at the corner of Geary and Powell Street in Union Square of San Francisco. General admission tickets are $11 and tickets for children under the age of eight are $7. You can bring your own skates or rent a pair for $6 at the ice rink. Sizes range from toddler’s 6 to men’s 14. The Holiday Ice Rink in Union Square also hosts some special events to bring people together. There is a single’s night, a Drag Queen Extravaganza, and a California-beach themed day. For a schedule of events at the ice rink, visit http://unionsquareicerink.com/special-events/.